Home / 2018 / November / 11 / Who Is In Control? Finally, when empires are weakened or collapse, God sometimes gives reign to those who could only dream about freedom and sovereignty. November 11th was not only the day of the armistice; that day, one hundred years ago, the first government of independent Lithuanian was formed, could finally come into power more than half a year after the Declaration of Independence. 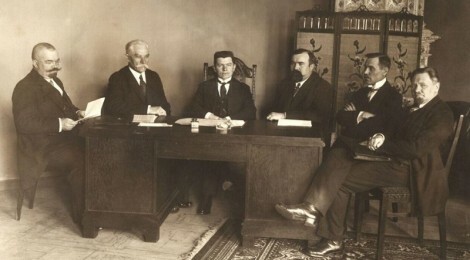 Two members of the cabinet of Augustinas Voldemaras were the brothers Jonas and Martynas Yčas, members of the evangelical reformed church of Lithuania (see the photography of the first government). The same day Marshal Jozef Pilsudski assumed control in Poland (therefore National Independence Day in this country). November 9th 1989 the Berlin Wall wholly unexpectedly came down. Some month later, in spring 1990, God granted freedom to the Lithuanian people which through its members of parliament proclaimed a sovereign and independent state on March 11th.